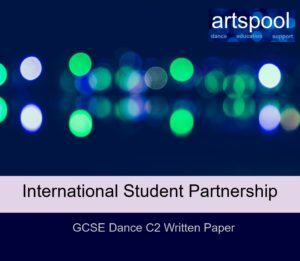 Our International Partnerships Programme is designed to support GCSE Dance teachers overseas. We understand how isolating it can be to be teaching the course away from the usual dance network in the UK. We understand that you can’t just take your students to an artist led workshop, or even go and see the anthology works live should they come around. We know you haven’t got anyone to bounce ideas off or consult with and we know you want the very best for your students. 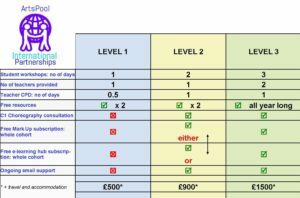 We now offer 3 levels of face to face support for our international schools. We can come out and work with your students on embedding the Anthology, run student revision sessions for Year 11, spend a day with you consulting on your students’ practical work. We can work with you to devise an annual programme of support, a long term programme or a one off. Whichever suits you best. To make it cheaper for you, we also run a new online student workshop programme. Details can be found below. I would highly recommend Heather from ArtsPool for any one that runs GCSE dance courses any where in the world! International Online Student Workshops Starting January 2019. Choose from a Year 11 programme, a Year 10 programme, or do both for a discount of £150. Workshops run at a time to suit you and your time zone. Two 1 hour online workshops per month: Jan through to May 2019 focusing on how to answer the range of questions on the C2 written paper. 10 workshops in all. One written task set per month, set on the 1st monthly workshop. Answers are emailed to us for marking and personal feedback. Rewards are issued for strong answers or greatly improved work. The workshops are recorded and emailed to schools for reference at a later date. One 1 hour online workshop per month: Jan through to July 2019 focusing on content. The later workshops start to focus on answering questions. 7 workshops in all. Two written tasks set May and June 2019.